Sorry about the month-long hiatus. I had to take a break for health and family reasons, plus I had a few paying writing gigs that took priority over non-paying blogging. I'll try to avoid such lengthy absences in the future and I appreciate everyone being so patient. Sorry pals! Many thanks to the DLB reader who supplied me with exploding teeth Midgard Serpent action! As a long time reader, I am very glad you're back. HA! That was my Midgard Serpent action, baby! (Which, now that I think about it, sounds kinda dirty.) Glad to have you back and healthy, Dave. Glad you're back; hope you're feeling better. All splashpage Midgard Serpant battle issue. Pure freakin' bliss. Good to have you back, Dave. You're my only comic book blog, because you're the right balance between "casual fan" and "crazy." Great to see you back in harness Dave. And kudos for reminding children that book burning leads to blindness and hairy palms. Health reasons? Did you drop your cell phone in the toilet again? I kid. Welcome back, Big D. Hope you're feeling better. Why you no write, Dave Campbell? This was an awful long month with no posts from DavesLongbox as well as none from rocknrollnerdguy. At least you´re healthy again and blogging. Although that makes me look like a lazy bum again. I enjoyed the feeling of being productive and producing content on a regular basis ( which was only hampered when my internet browser was on the fritz again ) but we all know good things don´t last. Well, nevertheless it´s good to have some competition back. 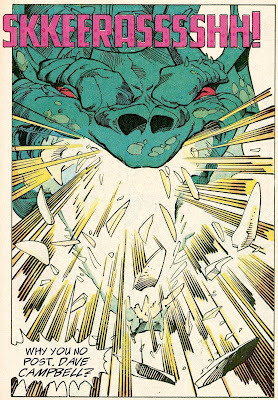 I was beginning to feel that talesfromthekryptonian was the only cool blog that´s left. Seems to me it'd be less effective to defenestrate people at street level. A lot of Punisher fans are all about the violence, after all. I guess nothing screams vengeance like a two foot plummet to the sidewalk. :P I tease, the phrase just leapt out at me. welcome back daddy.. hope your ok now.. glad you are back again.